HomeAway and the Alliance for Neighborhood Prosperity have partnered for a series of meetings on short-term rentals. The first was on Tuesday in Treme. As New Orleans’ city government moves to tighten restrictions on short-term rentals, a prominent local rental operators’ group is partnering with HomeAway — a major rental platform — to advocate for the industry and push policy changes that they say represent a compromise between short-term rental proponents and critics. The group, the Alliance for Neighborhood Prosperity, and the company are hosting four meetings through the end of the month to counter criticism emanating from local community groups and government officials. 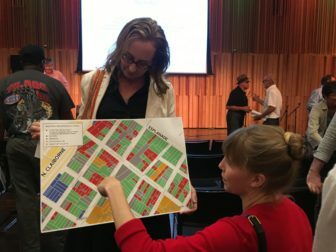 The first of those meetings was held Tuesday night in Treme, a neighborhood that has seen one of the densest concentrations of short-term rentals in the city. The Alliance and HomeAway seemed to recognize that changes to the city’s year-old short-term rental law — which critics have characterized as allowing the unfettered expansion of short-term rentals throughout much of the city — may be inevitable. In an attempt to preempt more restrictive changes, the group is offering some concessions to short-term rental critics, including a citywide cap on the number of rental licenses and an increase in nightly fees that are earmarked for the city’s affordable housing fund. But some of those critics don’t see much of a compromise. In fact, the proposals would actually loosen legal controls in two key areas: lifting a ban on short-term rentals in the French Quarter and lifting all short-term rental restrictions when a prospective rental operator plans to fix up a blighted property. And the suggested cap is higher than the number of licenses that have ever been active at one time since the law took effect. But in an interview, Breonne DeDecker, program director for affordable housing group the Jane Place Neighborhood Sustainability Initiative, said she’s met with HomeAway representatives, and the company is not so interested in residents’ concerns about affordable housing. Meg Lousteau, a critic of short-term rentals, shows a map of rental licenses around her block in Treme. HomeAway, which also owns short-term rental platform VRBO, is based in Austin, Texas. The company is a subsidiary of travel industry giant Expedia. In a report issued earlier this year, Jane Place said the expansion of short-term rentals — through sites like VRBO, HomeAway and Airbnb — has exacerbated an affordable housing crisis in the city, removing housing units off the long-term rental market, pushing housing prices up, and forcing residents out of neighborhoods. The group has called to limit “whole-home” short-term rental licenses to one per New Orleans resident — as verified by a homestead exemption — among other proposed restrictions. In May, the New Orleans City Council took its first major step toward limiting short-term rentals since they were legalized, placing a freeze on one category of whole-home rental licenses. The freeze applies to temporary licenses — the most common of the three types of licenses the city introduced last year. Temporary licenses allow property owners and tenants to rent out full houses or apartments to tourists for up to 90 days per year. The measure is only in place in certain neighborhoods — historic areas that have seen the most short-term rental activity — but the council is considering another measure that would expand the moratorium citywide. The freeze is intended to remain in place at least until the City Planning Commission completes study on the effects of legalized short-term rentals and the council votes on its recommendations. The study could recommend significant restrictions to the industry. The council instructed city planners to consider tightening the law, including by placing caps on the number of licenses allowed in neighborhoods and requiring that license holders be residents of the city. A draft study was originally scheduled to be released this week, but the deadline has been extended to September 18, with a commission vote on it set for September 25. Critics often denounce short-term rentals as exacerbating the city’s affordable housing crisis and providing a boon for a small group of investors, many of whom are not based in New Orleans. 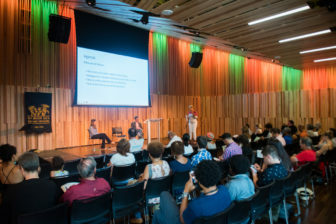 But Tuesday’s meeting provided an opportunity for HomeAway and the Alliance to emphasize the positive side of New Orleans’ short-term rental boom. “We’re trying to get ourselves in a position that short-term rentals isn’t a bad word,” Randolph said. Hodgini played videos of individual success stories over bubly music and picturesque b-roll of sunny New Orleans streets. One was called “From Blight to Bright: One Family’s Story of Whole Term Rentals in New Orleans,” which featured Alex Ramirez, who, as of Wednesday, held 15 licenses — all of which allow for whole-home rentals — down from 27 earlier in the year. Several audience members shared similar success stories. But others weren’t convinced by the personal testimonies. Bay argued that the short-term rental industry helps the region’s economy. Last spring, the Alliance commissioned and released an economic impact study from the University of New Orleans’ Hospitality Research Center. According to the study, about 595,000 people stayed in short-term rentals in the New Orleans area last year, generating $900 million in economic impact. The Hospitality Research Center has not responded to a request from The Lens for the data it used to arrive at the results. A HomeAway video presentation also claimed that 62% of short-term rentals in New Orleans were formerly blighted properties, a number based on a 2016 member survey by the Alliance for Neighborhood Prosperity. Prior to the meeting, HomeAway, in partnership with the Alliance, released Whole Home, Whole Community—a one page list of policy proposals framed as a compromise between the pro- and anti-short-term rental camps. Another suggestion is a modification to the short-term rental fees earmarked for the affordable housing fund. Currently, that fee is $1 per night. The HomeAway recommendation would increase the fee to two percent of the cost of the booking and expand its applicability to all lodging accommodations, including hotels. Last year, the $1 fee only raised $230,000 from January to October 2017, according to the Jane Place report. At the meeting, Bay said the proposed increase would raise $20.6 million per year from short-term rentals alone. But in an email from HomeAway spokesman Phil Minardi, the company clarified that the figure was based on a two percent fee for all tourist accommodations, not just short-term rentals. HomeAway’s one-page policy paper emphasizes “compromise and collaboration” rather than “bans or onerous restrictions.” And Bay echoed that sentiment, implying that short-term rental opponents were stubbornly extreme. “They say, ‘ban, ban ban. No no no.’ We want to engage,” Bay said. But DeDecker noted that her group has not promoted a ban. 5:30 p.m., Wednesday, Aug. 22 at KIPP Leadership Primary, 2300 St. Claude Ave.
5:30 p.m., Thursday, Aug. 23 at the Rosa F. Keller Library, 4300 S. Broad Ave.
5:30 p.m., Thursday, Aug. 30, at the Algiers Regional Library, 3014 Holiday Dr.